Mangaluru, Apr 17, 2018 : The annual ordination of the diocese of Mangalore today is to be a red letter day. 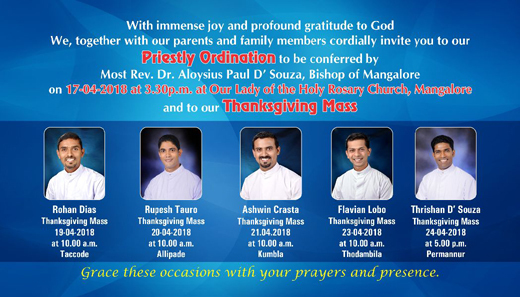 The ordination - anointing or ’Abishek’ a solemn ceremony of the church will take place at 3.30 pm, today, April 17, at Rosario Cathedral, presided over by Rev.Dr.Aloysius Paul D’Souza, Bishop of Mangalore, assisted by a large number of the clergy. The five Deacons to be ordained are : Rohan Dias of Taccode, Rupesh Tauro of Allipade, Ashwin Crasta of Kumbla, Flavian Lobo of Thodambila, Thrishan D’Souza of Permannur. All have been preparing for this day for several years at st.Joseph’s Seminary, Jeppu. It is expected that a large number of clergy, religious, family members of the ordinands, well wishers and congregation will be present at the 2 hour solemn ceremony. It is such a blessing to the diocese of Mangalore that these young men dedicated their life to serve God. May their families be blessed . The article was very informative . May God help them and the holy spirit lead them on to work in His Vineyard .